How Do Worms Spread in Cats? So What Is the Best Cat Dewormer? Most pet owners have probably heard the dreaded term worms before, but what are they? Worms are a type of parasite that can infect any species of pet. No animal is immune, and neither are you. Humans are also commonly infected with these pests. There are a variety of different species of worms that can affect your cat in specific ways. The majority of these nasty critters infect your pet internally, with the majority of them living in your pets gastrointestinal system. The most prevalent types of worms are tapeworms, hookworms, roundworms, and heartworms. 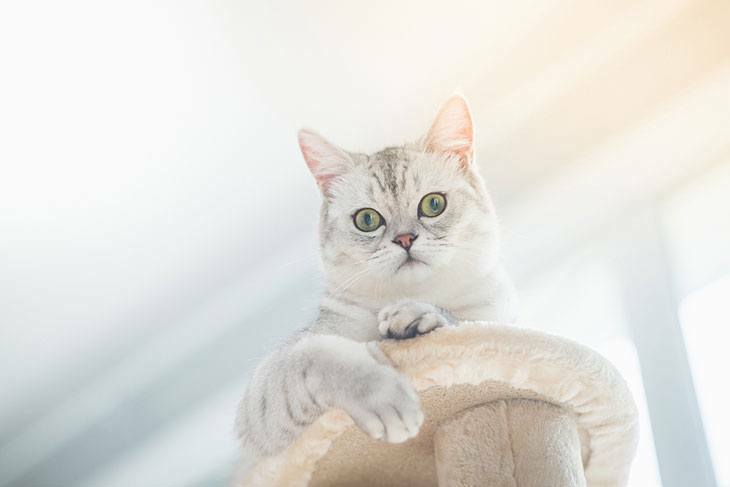 Even though it might seem like they are just nuisances, worm infestations can have severe effects on your cat’s health. Heartworm infection specifically can be life-threatening. These parasites can infect many essential organs in your cat like their pulmonary and respiratory systems. All of these pests reproduce in your cat and spread through their feces and other bodily fluids. From this, it becomes apparent that there are a variety of ways in which your feline friend can become infected. Outdoor cats are especially vulnerable. Depending on the type of worm, and the extent of the infestation the parasites can make your pet quite ill. You should always keep an eye open for possible signs that everything is not right. Below is a helpful youtube video that discusses more signs of tapeworm infestations. You should take your cat or kitten to a vet if you suspect that there might be something wrong. Remember that there won’t always be signs of the infection. Even if you can’t notice anything abnormal, you should still ask yourself when was the last time you had your cat dewormed. Your veterinarian would generally deworm your cat during their annual check-up. As you can see, worms can cause a variety of adverse reactions in your pet and can even have fatal consequences. In addition to this, if your cat is infected, you can be exposed to these bugs too. The drugs work by targeting the parasites themselves or by helping your pet to fight them off. Some wormers kill the parasites themselves while others get rid of their eggs and therefore stop the reproductive cycle. Some of the products that are available only need to be administered once while others could require multiple does. So it is important to follow manufacturer’s instructions carefully. Deworming treatment is supposed to make your cat feel better, not worse. You need to make sure that the medicine won’t harm your pet. Although all medications have potential side effects, these should not outweigh their benefits. An essential part of assessing the drug’s safety is to check whether it is certified by the relevant medical and governmental boards in your country or state. This status should be visible on the packaging but if you are unsure you can consult your vet. Another priority when you buy a dewormer is to check whether the treatment is effective. The medicine should help you to eliminate these parasites. You need to keep in mind that there are multiple types of worms which need different medication to get rid of them. So you should try to establish, possibly through the help of your vet, what worms your pet has. Because this is tricky broad-spectrum drugs which target more than one parasite is often the best option. Cats are known, picky eaters. Most OTC (over the counter) deworming treatments are made to be ingested orally by your pet. There are products in the form of powders, gels, pastes or tablets. The brands that produce these medications usually try to make them as tasty as possible. However, each cat will have their preferences so think about your cat before making a purchase. Senior, adult cats and kittens all have different tolerance levels. Worms can also affect each of them in different ways. The majority of products are tailored made for specific ages. Most treatments won’t be suitable for newborn kittens. In addition to this, you should weigh your cat before purchasing or administering the drugs as this will affect the dosage that they need. 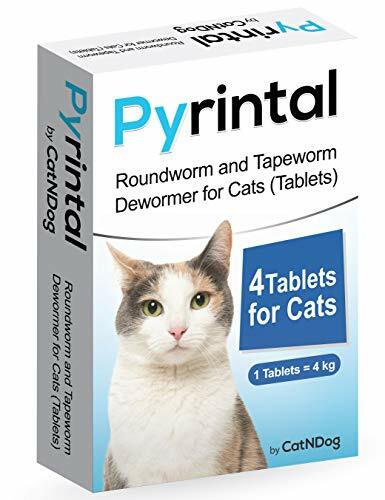 Pyrintal Roundworm and Tapeworm Dewormer is a broad spectrum dewormer which is effective against roundworms, tapeworms, and hookworms. These are some of the most common parasites. The product comes in the form of tablets. Similarly to the other pills on the list, you can feed the dewormer to your cat whole, or you can crumble into their food. Because it can be crushed and is highly soluble, you can even dissolve it in water and administer it orally with a syringe or dropper. The dewormer is suitable for cats of six weeks and older. Therefore it is safe for kittens older than six weeks, adult cats and senior cats. You can calculate the right dosage with the weight of your pet. It works out as follows: a cat of 2-3 lbs needs half a tablet, a cat of 4-8 needs one tablet and so forth. As the packet contains four tablets, it will provide two or more doses for your feline friend. So even though the product is more expensive than some of its competitors, you do get more than one use. One dose should be enough to eliminate the parasites, but if you still notice signs of an infestation after a month, you can administer another does. Bayer Tapeworm Dewormer is the second product that is made by Bayer on this list. The treatment is made specially to target two types of tapeworms. So, unfortunately, it won’t be adequate for addressing other worms and parasites. The products active ingredient is Praziquantel which is often used in medication for treating parasitic infestations. Bayer Tapeworm Dewormer comes in the form of tablets. You can feed the pills to your cat as is. In addition to this, you can easily crush or crumble them and mix them in their food which means that it is much easier to administer. The tablets are scored so that they can conveniently be broken into pieces. Its doses are easy to work out and administer. For a cat under 4 lbs, you need half a tablet, for a cat of 5-11 it is one tablet, and for a cat over 11, it is one, and a half pills. The dewormer is suitable for both cats and kittens as long as they are older than six weeks. Each bottle contains one tablet which is usually enough for one or two regimes Wait a couple of months after the first treatment before deciding whether it helped or not. If there are still some worms present, wait a couple of months before readministration. Bayer makes Drontal dewormer for cats. Bayer is a well-known manufacturer of high-quality health and supplemental products for pets. Like most of its other products, this is a high-quality and effective treatment. The drug is broad spectrum as it is effective against tapeworms, hookworms, and roundworms. One of the most useful features of the product is the fact that it is safe for younger kittens than many others on the list. It is suitable for cats who are older than four weeks and weigh more than 1.5 pounds. 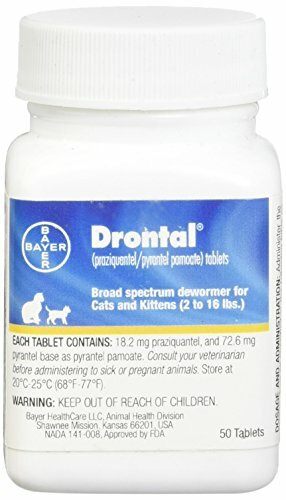 Drontal Broad Spectrum Dewormer comes in the form of tablets which are scored so that you can easily break them. The two ways in which your cat can ingest them is by you feeding it directly to them or by crushing it and hiding it in their food if that doesn’t work. The recommended dosage is based on the weight of your cat. Cats that weigh 1.5-1.9 lbs need to ingest a quarter of a tablet while a cat that weighs 2-3 needs half a pill. The dosage, therefore, more or less doubles as the weight of the cat doubles. Overall, this product offers excellent value for money as each bottle comes with 50 tablets. Pyrantel Pamoate Suspension is a dewormer that comes in the form of a liquid suspension. It is the only liquid medication on the list. It should be administered orally. The suspension can be mixed into your pet’s food or otherwise, you can use a sterile syringe to drop it into your cat's mouth. However, this could be tricky. Unlike most of the other products on the market, the suspension can be given to more than one species of pet. It is suitable for cats, dogs as well as horses. The treatment is particularly gentle and as such is suitable for adult cats and kittens from two weeks old. It can also be given to pregnant and lactating cats. But it's recommended that you consult your vet before giving any medication to a pregnant cat. The dosage needs to be worked out from your cat’s weight. You should administer 2.5 mg per pound that your cat weighs. Each bottle contains 50 mg, so you will be able to give your cat more than one dose. The product only targets adult parasites, and therefore it has to be given to your cat several times to make sure that all the worms are killed once the eggs have hatched. As a result of this, it needs to be repeated every three weeks until there are no more signs of an infestation. 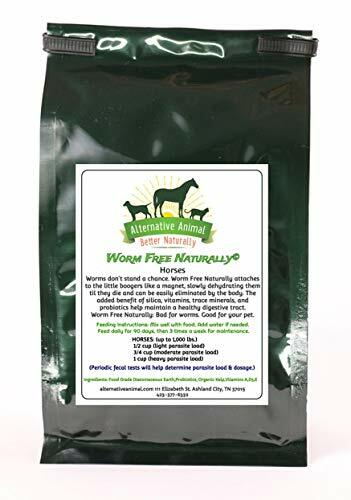 Worm Free Naturally is a wormer by the brand Alternative Animals which focuses on producing homeopathic remedies and supplements for your pets. It is contains all natural ingredients with no harmful chemicals that can build up in your pet’s system over time. This wormer treatment contains vitamins, kelp, and probiotics which means that this product not only gets rid of worms but can help to support your pet’s overall health. The way in which it tackles parasites is different from any other product on the list. It acts mechanically and damages the coating of parasites in ways that are fatal to them. Because it works in this parasites won’t build up an immunity to the remedy as they would to other medication. The product comes in the form of a powder that can be mixed in with your cat’s food. The food should hide the treatment nicely. However, if you cat is extra picky and discerning, this could be challenging. 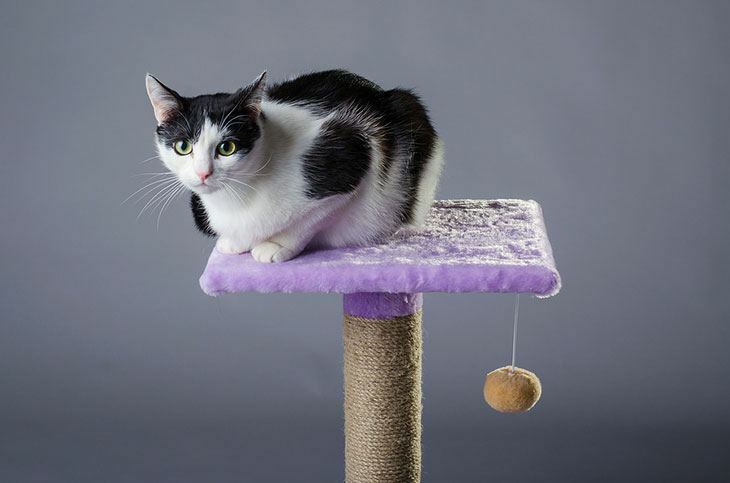 Worm Free Naturally is made so that it can be used for adult and senior cats. You can also give it to kittens once they have been weaned. 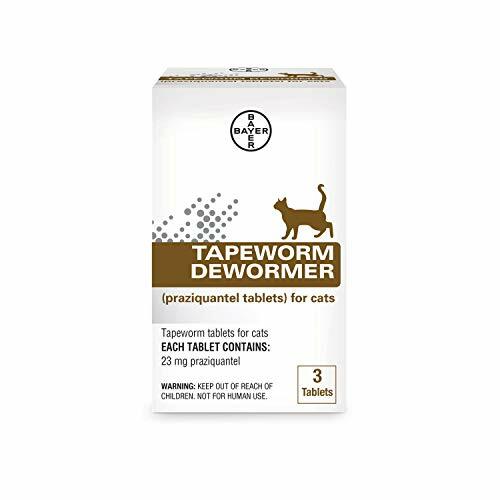 Its dosage instructions are less specific than that of other brands of dewormer as the package directs that large cats can eat one teaspoon with a meal while small cats and kittens can eat half a teaspoon. Alternative Animal recommends that you feed the correct dosage to your cat once a day for three months and after that give them one dose three times a week for maintenance. The product has the most extended treatment time on this list. However, the benefits could outweigh the costs and the effort. The products on the list are 5 of the best cat dewormer treatments that you can buy over the counter. Each of the products has their strengths and weaknesses and can be used to treat your beloved pet at home. It is crucial to remember that the treatments are more useful for certain worms than others and that your cat won’t respond similarly to all of them. In my personal opinion, the winner of this roundup is the Pyrintal Roundworm Hookworms and Tapeworm Dewormer. The product is extremely safe and can even be used for kittens as young as six weeks. Not many feline health treatments can say the same. In addition to this, it even targets multiple types of worms namely tapeworms, hookworms, and roundworms. One downside of the remedy is that it only targets adult parasites and therefore needs to be administered more than once. However, this is a small price to pay for the peace of mind that comes with knowing that your pet won’t suffer any adverse effects. Which product do you prefer? Tell us in the comments and share the article with all the proud cat owners that you know.